What was the feeling you had the last time you looked at your bank balance? Your paycheck? Do you think of yourself as financially sustainable? What are the criteria for understanding financial health? We’ll explore these questions and more in this workshop through a lateral-learning environment where everyone can engage in exploring the role of money in their lives. We’ll learn new tools from Critical and Systemic Thinking methodologies in order to assess how we use, relate to, and think about money, currency, and economy. 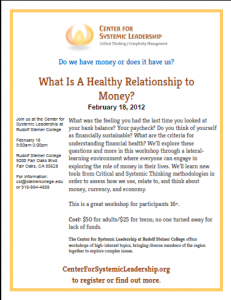 Read Jane’s blog post about this workshop “What is a Healthy Relationship to Money?” to learn more about this topic and how we will explore it. This is a great workshop for participants 16+. $50 for adults/$25 for teens; no one turned away for lack of funds. Download the flyer and share with others!